Tennis lessons are offered for ages 3 years through adult. Indoor lessons can be taken at The Lincolnshire Club and The Libertyville Club. Outdoor lessons are offered in Deerpath Park during the warmer months. 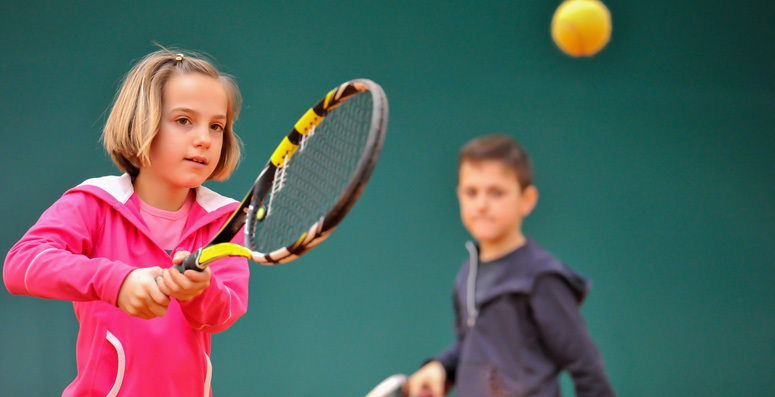 Students learn basic tennis skills, while improving social/group interaction. Parents accompany their child on the court so both parent and Pro help the student have fun and learn in a relaxed atmosphere. This is an introductory junior program. Basic hand-eye coordination, stroke development for the forehand and backhand ground strokes utilizing a Quick Start format. This is an excellent program for youth just starting to learn the game. Emphasis is placed on form and control. Students will be introduced to volleys, serves and ground strokes. Designed for students who want to qualify for their school team or improve their playing skills. Drills are used to imitate competitive game situations and improve students’ strokes. Learn to play tennis in just a few weeks. Even if you’ve never held a tennis racket, we can get you started playing and enjoying a great sport. Emphasis is placed on reinforcing the tennis basics; forehand and backhand ground strokes, volleys, and serves.